I have been lurking on the forums for a while now, but thinking about and planning a pool for a few years. Looking to get the pool started in the next few weeks. I have a lot to learn and am hoping to learn a lot and value any feedback or suggestions. I will be doing as much of the build as I can and sub out excavation, electrical, gas, concrete. Below is the list of what I am planning to do. Any thoughts or feedback is appreciated. I am also going to do a spillover spa. I have read a lot of varying opinions, but whenever we go to pools that have them my wife and kids love them. We wouldn't be able to use it in the winter when the pool is closed, but for our usage we are ok with that. Let me know any thoughts or questions I should be thinking about. Hello and welcome to TFP! The only thing that stands out in my eyes is your filter. I believe the C900 is a single cartridge filter right? I have the C1200. If you're going to get a single cartridge filter, I would get their largest - like the C1200. It's about the same footprint in size on the pad. Us single cartridge users will still have to rinse-off our cartridge more frequently than say someone who uses one of their 4-cartridge filter systems, but I think you'll do a little better with a larger filter. The main benefit of a larger filter is really for greater separation between cleanings. Congrats on the new pool, and welcome to TFP! a 16x32 with an 8 ft end will eat up that entire pool, literally will be all diving....do you have a drawing or cross section you can scan and post? In your part of the area I would think about a stand alone spa so you can use it in the cooler months. It can go right by the pool but not spill over into it. Thanks for the advice on the filter. The purchaser I am using it looks like I do have the option to purchase a C1200, I also could go up to a C2030 which has 4 filters. Is the main benefit less time between cleanings? Is it worth it? Any other benefits? West Jordan is near Salt Lake City. You can find a cross section at this link. It will have 8' before dropping off. It seems like plenty, but I don't have experience with a pool . I could possibly only go to 7' deep(I'm not sure how that would impact the shallow) or go with 36' length depth, that would eat away at a lot of decking on the sides. Is the main benefit less time between cleanings? Is it worth it? Any other benefits? A bit of efficiently perhaps, but more than anything more time between cleanings. I'm out in the country with my C1200 and I clean it about every 3 weeks or so. Just pull it out and rinse. Those with a set of 4 might do theirs twice a year. Just depends on activity and the environment. I am being recommended to get 2 aqua genies and 1 return. These seems like a love them or hate them topic. Any recommendations? Also should I install main drains? I like the idea of keeping things simple, and introducing less areas for potential problems and leaks by not doing main drains. Will the aqua genies really circulate well enough? What would other options be? I do worry about only one return BUT if you PB has a valid reason and can assure you that will work let him do his thing. Thanks, I'm doing most of the build myself and going to sub out various parts. The aqua genies do have a return built into them. That should make 3 returns. The builder I'm consulting with assures me this will work and swears by them. Next question as I'm trying to get all the contractors lined up. For the concrete decking how deep gravel and concrete base for the deck? I'm also going to do a cantilever concrete coping. I want to make sure I plan correctly for deck depth when doing my dig. I looked at those aqua genies! Those things are NEAT! I am really thinking about looking to see if they would work in my above ground round pool. They do say you can put the chlorine pucks/tablets in them. That is not a feature you will want to use all of the time as the pucks add stuff to the water like CYA (stabler) that will build up over time and result in you having to drain and refill some water to lower the CYA level. Well the dig has started. The base to shallow depth is almost complete. Some grading and dig out of the hopper. One question I do have, I have really rocky soil, the excavator has some concerns about getting the sharp angles to the hopper bottom without everything crumbling. Assuming the worst and the walls crumble, how can that be corrected? Just additional poolcrete? They might have to "flash" the soil which is where the shoot a thin layer of gunite to help it hold it's shape. Talk to your PB about how he handles it. Each builder has their way of doing stuff. Let us know what he says. I grew up in West Jordan in the 80's when it was in the middle of nowhere. I can't believe how much it's grown. I took swimming lessons at a friends house who I swear had the only backyard inground pool in the entire city. I would have given anything to have a pool in my backyard when I was younger. Congratulations and good luck on your build! 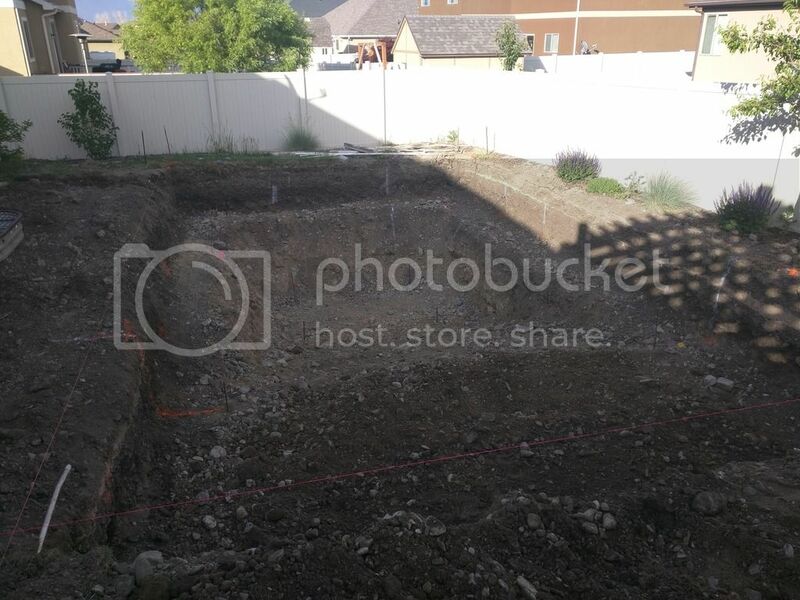 Please post lots of updates and pictures as I'm very curious how a build in the Salt Lake valley goes. The dig should be finished on Tuesday after the holiday, then I get to wait a few weeks for all the equipment to be shipped. 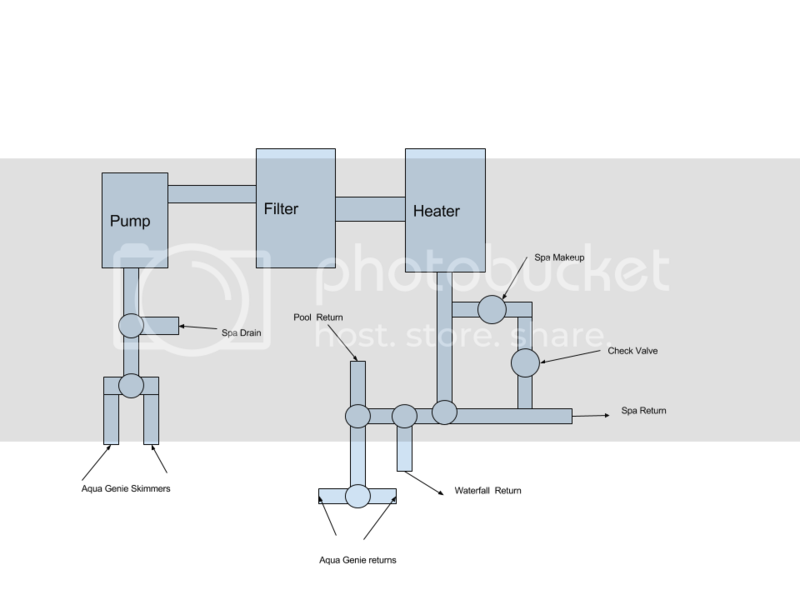 During that time I would like to do as much planning and prep work as I can, to get get started I have taken a first pass at putting together a plumbing diagram. Please provide any feed back or thoughts. A couple questions I have and clarifications on the diagram. 1. I am planning on using Jandy valves, anything else I should look at? It does seem Pentair valves are cheaper, should I bother? 2. I'm not sure if I should have a bypass around the heater? There will most likely be times that I don't want the water heated, I'm not sure If I can run it through the heater without heating it. 3. I am planning on using a single pump, I know this will limit what I may be able to do(run waterfall and spa at the same time) I am ok with this limitation, any thing else I should be aware of that I am not thinking of? 4. for the waterfall I haven't totally decided yet, but probably a 15" or so wide sheer descent, it will only have 1-1.5' foot rise. So the dig is complete, as I feared the sloped walls in the deep end hopper collapsed with the rocky soil I have. Looking for suggestions on the best way to fix this or what my options may be. I have attached a photo that shows the dig. It's a little hard to see with the lighting, but in the hopper bottom you can see stakes, the wall should slope from the stakes to the overdig wall. Doing some research on the best way to fix this, I did find this blog post. I would really hope to not have to fill in the hole and go this route, but ultimately if this will yield the best longterm results I am open to it. Does anyone else have any thoughts on that approach and how well it would work? Sorry, can't help with that question but welcome and can't wait to see your project progress! So first I wanted to give a recommendation to Penguin Pools. I haven't used them, but I cold called them with a question on how to deal with rocky soil, and they called me back and took time to listen to and walk me through how they would solve the problem. They are in a completely different state but took time to respond, I think that speaks volumes to their character as a company. I decided to fill in the deep hopper end with road base compacting every 4-6 inches. I finished that almost two weeks ago, and have let the dirt continue to settle. The rest of my equipment comes tomorrow, so I will be starting up and hopefully posting lots of updates, and definitely asking lots of questions as I get started.